The heavens opened around 6:30pm and Jupiter Pluvious [sic Frank Varey] decided to try his hand at track preparation. Phil Griffen was obviously keen to go ahead and Graham Trollope went into action. The sludge was bladed to the outside and by 8:40 ish the klaxon sounded for the start of heat 1. Charles trapped from gate 3 and rode a good line but James just didn't have the speed to challenge Victor Palovaara. Connor passed William Lawson into turn 3 on the second lap of heat 2 but Broc was left at the back until William pulled up. Josh Pickering gated ahead in heat 3 but comes under pressure from Kasper. Todd finished third untroubled by Richie Worrall. Kyle traps ahead in heat 4 but Broc is left at the tapes. Erik Riss challenges hard for a couple of laps but Kyle eases his way into a decent lead by the chequered flag. Ricky Wells gets the drop in heat 5 and Todd pushes hard but just misses out on the finish line. Tigers in an unusual position, ie 2 points ahead! Erik traps to lead heat 6 and James dives past Charles into turn 3. James never looks like challenging for the lead, but equally Charles seems content with third place. Kyle traps to win heat 7 but all eyes are on Connor although Richie has his measure. James and Broc were our starters for heat 8 but failed miserably to impress, missing the gate and struggling for speed. Kasper made a perfect start from gate 4 to lead heat 9 and Todd held off Erik for a glorious 5-1. Richie traps to lead heat 10 from James with Josh and Charles debating 3rd. The Tigers are just clinging to their narrow lead. The Monarchs trap ahead in heat 11 but Kyle picks off Victor. Connor tries the old heave-ho on Victor on the inside of the third bend but Victor just shrugs him off. Drama at the start of heat 12 as Kasper can't get his bike started. With less than sixty seconds to go he sprinted back from the third bend and a machine is rushed out to meet him. Whose bike? Captain Kyle, or Charles, or Todd? No, James at 5ft and a bit and the only team member who is Jawa mounted rushes his bike out for 6ft something Kasper. To his credit Kasper got it to the first bend in the lead which is more than James usually manages but he was quickly passed by Josh, and then on lap 3 by Joel. (Still say there's no difference between Jawa and GM James?) Charles and Kyle trap to lead heat 13. Erik tries a very wide blast on the pits bend but Kyle blocks his line and the 5-1 brings the scores level again. Todd and Connor need a heat advantage to give us a winning chance, but Richie and Joel make the gate. Connor is challenging hard but on the third lap he clips Joel's rear wheel on the apex of the third and fourth bends. Todd lays down and avoids the mayhem completely and thankfully all three are able to walk back to the pits. 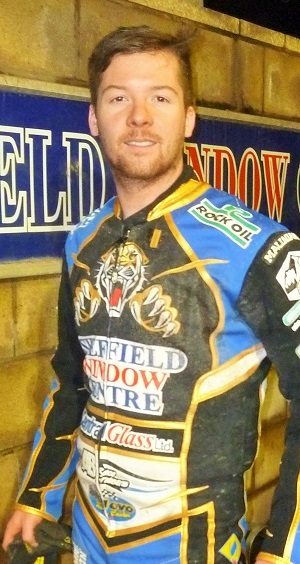 Race awarded and the Tigers now need a maximum heat win from heat 15 just to draw the match. Monarchs strangely choose Worrall to partner Ricky while the Championship Best Pairs were Simon's obvious choice. Kyle traps and Charles has little trouble holding Ricky off before Ricky retires at the end of lap 3 and the meeting finishes as a draw. A better result, but it could so easily have been a win. Who knows what is going to happen to speedway in Britain next season. Obviously the Sheffield promoters are looking forward as they have announced their first signing, namely Zaine Kennedy, the young Australian who finished second to Connor in our recent Top Gun meeting.